Camera nerds, this is exciting. 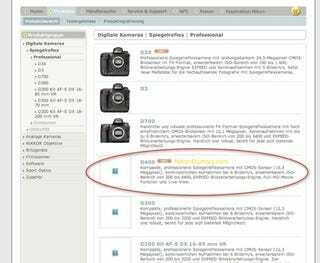 Just a couple of days after Canon's 500D pops up, Nikon's D400 supposedly made an appearance on Nikon's German site. And the specs are just what you'd expect. It's got a 15.3-megapixel sensor with a standard ISO range of 200-6400, 6FPS bursts, and yes children, full HD video recording, which would make it Nikon's first to shoot in 1080p. In other words, a pretty solid bump of the current D300, the main new hotness being the addition of full HD video.